Receive 6 to 8 functional, fun, and shreddable mountain bike products every other month. Vital MTB’s editors are always riding and testing new products. We use that expertise to build fun and functional MTB surprise packages for you. A Gear Club box is sent to you every other month. The price per box is only $49.95 plus $5 shipping (non-U.S. shipping charges vary). There’s no long-term obligation and you can opt out any time. The products we choose are from trusted MTB brands. Some items may even be season-specific, so you’re prepared for any conditions. 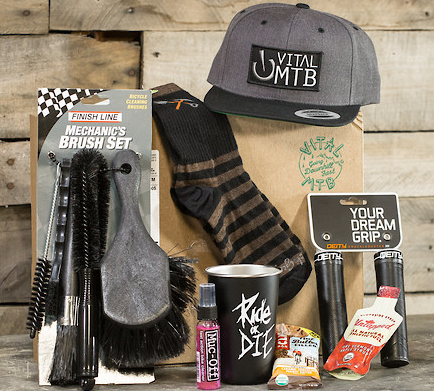 Vital MTB Gear Club is the best subscription box for mountain bikers. Shipments are sent every other month. Looking for a sparkly pink Warden? Or maybe a metallic black gold Endorphin? Knolly have a fresh batch of frame colors on the way for 2019, and there's even a new gravel grinder in the mix.